The ‘Grand old Lady’ remains unmoved. 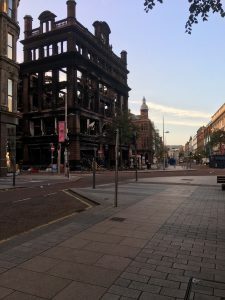 The news that, following the Bank Buildings fire, Belfast City Council (BCC) and Primark are allocating £1.75m for city centre recovery is very welcome. The further announcement that Primark are actively considering resuming trading in their new building on Castle Street to the rear of the Bank Buildings is also welcome. If this is realised it will address concerns already expressed by Ulster Architectural Heritage (UAH), that the proven trading success of the company as a magnet for retail footfall on the Castle Junction retail and built heritage node must be maintained. UAH have already suggested to BCC that the accelerated commissioning of the new, Castle Street, Primark building could quickly restore the retail footfall that would be unlikely to return following a relocation elsewhere. The situation regarding the fire damaged, listed Bank Buildings, however, remains confusing. Now a full month since the fire, the most recent BCC press release describes the building as extremely dangerous and unstable. This does not align with other recent statements from BCC and the Historic Environment Division of the Department for Communities which say that assessment of stability is still ongoing with no conclusion yet reached. On a general basis all seriously fire damaged buildings are extremely dangerous but not necessarily unstable. Similarly, small debris will be blown off any damaged or even poorly maintained buildings in high winds. 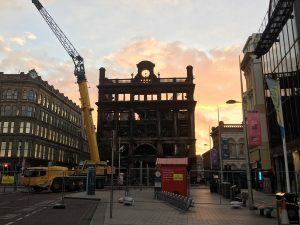 However, with the Bank Buildings, the public will note what official press releases are not saying, that is, that the ‘grand old lady’, in her one hundred and nineteenth year, is still standing straight and square at Castle Junction, having been stress tested in the strongest winds the City has experienced for many years. Nature’s way of assessing stability is perhaps as good an indication as any of the quality and strength of the original design. The built heritage assets of NI are crucial to an economy which is promoted as drawing investment towards a uniquely distinctive and culturally attractive place to live and work. Undoubtedly the cultural assets of the Ulster traditions, music and literature, form two pillars of NI distinctiveness. It is bizarre therefore that a third pillar of cultural distinctiveness, our architectural heritage is not even mentioned in the NI Programme for Government. While the joint Primark BCC allocation of £1.75m to city centre recovery over the next 3 months is very much to be welcomed. It should be separately noted that £1.75m represents three times the total annual budget allocation for built heritage grant assistance for the whole of Northern Ireland, and over 8000 listed buildings. For owners of listed buildings doing their best to deliver a clear public benefit to their localities…..this is simply a ‘slap in the face’ from Stormont. UAH continues to advocate for the retention and restoration of the bank buildings and reinstatement of previous levels of listed building grant aid, that amounted to over £4M up until 2014.